Some of the derelict inhabitants of “La Isla De La Muñecas”, located on Teshuilo Lake, Mexico. Ghost stories. Every culture around the world has them and, whether they arise from ancient folklore, the Gothic novelists, or the humble campfire, they continue to both frighten and fascinate. What is it about the ghost story that has held our collective fascination from time immemorial? I have a personal theory that, beyond their chilling narratives, there’s a psychological comfort to be derived from the ghost story. The very idea of a ‘ghost’ fundamentally supports the belief in an afterlife and that something exists beyond the grave. In spite of geographic, political, or cultural differences, an intrinsic fear of death is the one thing we all have in common. In the late 1950s, Don Julian Santana Barrera came to inhabit the nameless island on Teshuilo Lake, which [was] then a lonely, overgrown spot and seemingly perfect for his hermit-like requirements. But, unbeknownst to Julian, the quiet island has a dark history. Local legend maintains that in the 1920s three young girls were playing on the island, only for one of them to drown, falling into the canal’s murky waters close to a small jetty. The nearby residents claimed that the dead girl’s spirit refused to pass on and remained tethered to the island. The area soon gained a degree of infamy and few dared to venture near the supposedly haunted land, especially at night. Now, with Julian’s arrival, the girl’s spirit once again had someone to talk to. She told him of the manner of her death and asked him to find dolls for her to play with; adding that they would also help to ward off the ancient and evil spirits that still wandered the prehistoric wetlands. Evidently, Julian listened to the girl’s appeal, and began to search the area, scouring the rubbish dumps and plucking any discarded dolls that floated on the gently lapping waters of the cloudy canals. Some of the thousands of dolls that haunt “La Isla De La Muñecas”. At first Julian was thought to be something of an oddity; a crackpot who would gather unwanted dolls because he thought they were actual children that he could nurse back to life, but eventually people realized that he was simply a harmless old man with a rather peculiar past-time. In time, Julian accrued so many dolls that the island came to be called La Isla de las Muñecas (The Island of Dolls) but according to Julian, no amount of plastic companions seemed to satisfy the spirit’s thirst, and soon thousands of the toys festooned the island’s every square foot. Julian even constructed a modest hut for the purpose of housing a shrine dedicated to the dead girl’s spirit and the most special dolls he was given. On April 21st 2001, Julian and his nephew, Anastasio were fishing on the island. Julian told his nephew that strange voices had been calling out to him from the waters of the canals, beckoning him to enter the water and join them. He explained that he had often heard weird voices, but had always been able to resist their calls. The two men carried on fishing together until Anastasio left to undertake some errands. When he returned he discovered his uncle floating face down in the canal near the small pier – at the same place that the girl had lost her life in the 1920s. 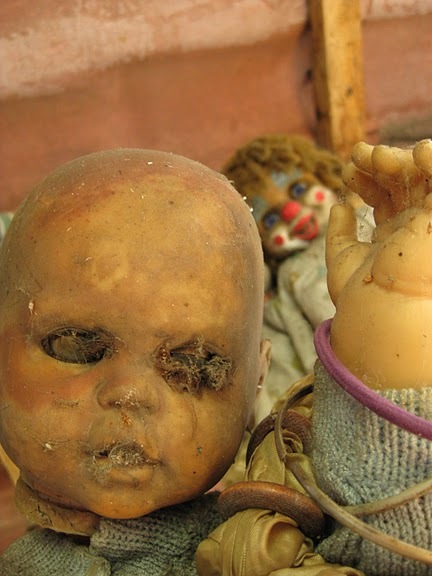 — Source: ‘The Mexican Island Haunted by Evil Dolls‘, on the Environmental Graffiti blog. Of course, the cynic in me says that the story of Julian Barrera and the drowned girl are completely apocryphal, and some enterprising locals collected discarded plastic dolls and decorated the island, inventing this ghost story in the hopes of attracting tourist dollars to an off-the-beaten-path region of Mexico. Whatever the truth behind the dolls, it’s still an impressive and effectively eerie sight to behold. 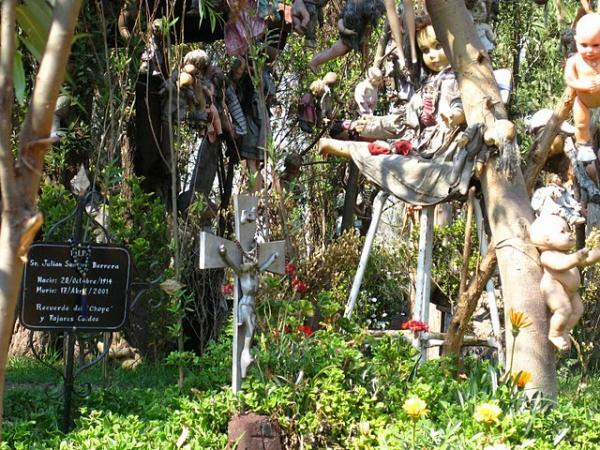 Click on the link above to view more creepy photos of the ‘haunted’ Island of the Dolls. ← Horror Films 101: 5 vampire films you may not have seen.